While it seems the Panama Papers are a genuine attempt at exposing rampant corruption of the world’s corporate-political uber-elite, a closer inspection reveals a likely Western geopolitical power play utilizing the latest techniques in information warfare. The 11.5 million documents that were stolen from Mossack Fonseca were leaked to Suddeutsche Zeitung, which then turned to the International Consortium of Investigative Journalists to investigate the documents. This process created a dynamic where control of the information resides in the hands of corporate mainstream media, thus allowing them to cherry pick stories they deem “newsworthy” – this exclusive access is troubling. The reason this exclusive access is troubling becomes apparent when one recalls the infamous incident where The Guardian physically smashed the copies of the Snowden files in their possession upon the command of MI6 and the British government. Had the Mossack Fonseca documents been turned over to WikiLeaks, the information would have been released en mass, as to allow for a publicly searchable database that would allow for anyone to search the documents in detail. 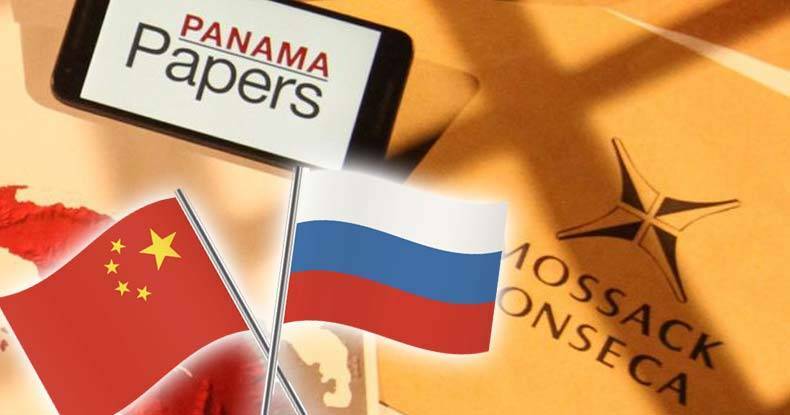 The immediate initial reporting on the Panama Papers has been curiously focused on Russian President Putin and Chinese President Xi Jinping, the leaders of two countries that have been recently labeled as strategic threats by Washington – with explicit implications that both of their leaders are corrupt. Coincidentally, the U.S. has been working to actively “contain” both of these states – actively hedging against Russian influence in Syria and Ukraine, as well as actively engaging in an “Asian pivot” strategically designed to usurp a rising China and maintain U.S. hegemony. And while there are some pro-Western interests revealed thus far, such as holdings by British Prime Minister David Cameron’s father, Ukrainian President Petro Poroshenko and Saudi Arabian King Salman, the vast amount of the reporting has focused on the usual suspects demonized by the West. With so much power residing in the hands of journalists, it begs the question; who or what is behind the International Consortium of Investigative Journalists? The International Consortium of Investigative Journalists was launched by the Center for Public integrity – a group heavily funded by Putin arch-nemesis George Soros. Soros has been implicated in being a hidden hand behind numerous revolutions across the world. The simple fact that information is being kept out of the public’s reach seems to speak clearly to the fact that this leak is most likely being perpetrated with an agenda to destabilize certain powerful states that are working to create a more multipolar world i.e. (Russia and China) at the expense of U.S. hegemony. While there is no mistaking the corruption within every state apparatus on earth, curiously these leaks seem to focus heavily on those the U.S. political elite has established as threats. Perhaps there is more to come that will bring to light the corruption of the West as well… but until then, it looks to be a geopolitical hit job by the West — with a few sacrificial lambs thrown in to cause reasonable doubt.